Town of St. Marys (Single Tier Perth)Record Owner? Log in. Pop. 5,776. Town in Perth C., at the confluence of the North Thames R. and Trout Creek and C. Rds. 123, 130 & 139,35 km NE of London. The town was founded in 1841 by United Empire Loyalist Thomas Ingersoll, a brother of Laura Secord, heroine of the War of 1812. The town was plarmed by the Canada Company, which chose the location because of falls over rocky ledges in the river, which provided a potential power source. The place was fIrst called Little Falls and was so named when the post office opened in 1845. As the community prospered and grew, Little Falls was no longer considered an appropriate name. When Thomas Mercer Jones, commissioner of the Canada Company, and his wife, Mary, visited the town, Mrs. Jones was asked to suggest a new name. She christened the place St. Marys after herself and subscribed the sum of £10 towards construction ofa new stone school. Today the town''''''''s nickname is "Stonetown" because of the many limestone buildings built between 1850 and the early 1900s -- and there are some beauties: the 1880 neo-Gothic opera house, the 1891 Romanesque town hall, and the 1899 water tower. The two rivers caused surveyors of the Grand Trunk Railway some problems as they were pushing the rail line west from Toronto. They couldn''''''''t bypass the town, because in the late 1880s, more wheat was being shipped from St. Marys than from any other market in the country, including London and Toronto. The solution was to build two stone viaducts that remain in use today. The II stone pillars used in their construction required 20 double teams of horses, 100 labourers, 50 quarrymen, and 20 masons to put them in place. The pillars carry the rails across a span of more than 700 feet (213 m), 70 feet (21.3 m) above the rivers. Automobiles cross the rivers at a lower level, on two of the last few stone bridges remaining in Ontario. St. Marys has pro­duced a prime minister, and Canada''''''''s most successful retail businessman, and Thomas Edison worked nearby -- until he had to leave town in a hurry! The prime minister was Sir Arthur Meighen, who headed the Conservative government in 1920 and 1921 and briefly in 1926. The retailer was Northern Irish immigrant Timothy Eaton, who joined his brothers James and Robert in a business in St. Marys. Timothy and James handled dry goods, and Robert looked after the groceries. The operation was successful, but in 1869 Timothy opened a store in Toronto that used a cash system instead of barter and credit. The rest is North American merchandising history. When Thomas Alva Edison was 16 or 17, he was a night operator at St. Marys first railway station, located a couple ofkms outside town. To ensure operators didn''''''''t sleep on the job, they were required to tap out the code word for "six" every half-hour. Edison invented a device that automatically sent the code when a crank was turned, and he had the watchman turn the crank every half hour, while he slept. The scam worked well-- until the night a message came to hold a train in the passing track. Edison failed to relay the message to the train crew. Fortunately, the engineers saw each other''''''''s lights in time to stop. During the subsequent investigation, Edison quietly slipped away -- to invent the phonograph and electric light bulb and to take out patents on 1,029 other inventions. Beachville proudly claims to be "Home of Baseball" because the fIrst recorded game of baseball took place there a year before Abner Doubleday "invented" the game in Cooperstown, NY. But the Canadian Baseball Hall of Fame and Museum is located here because St. Marys native Dr. Adam Ford attended the fIrst game of baseball at Beachville, on June 4, 1838. He described the game in detail in a letter which is in Cooperstown''''''''s Baseball Hall of Fame, but officials there have never formally recognized Beachville''''''''s claim. The British do not concede baseball was "invented" at all. They claim it is merely a variation of the game "Rounders" that has been played across the British Isles for at least four centuries. 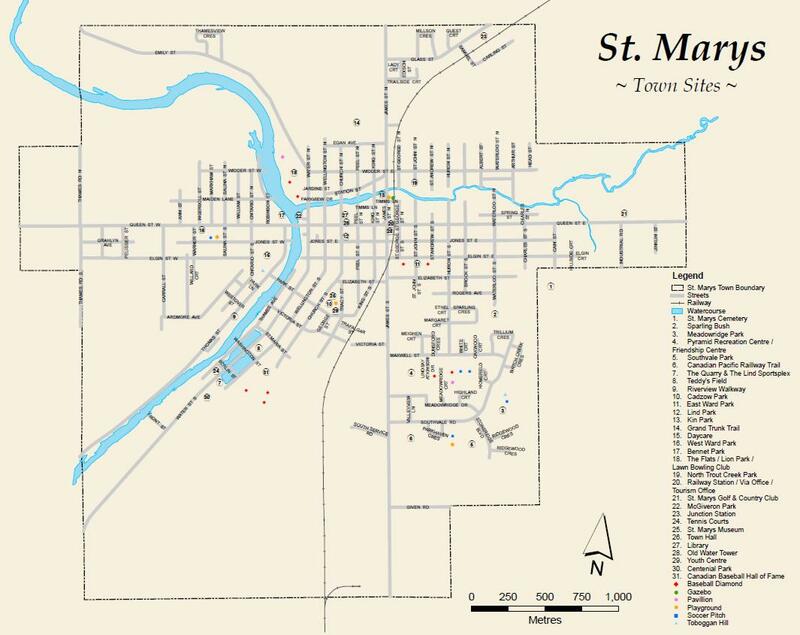 Have something to say about Town of St. Marys (Single Tier Perth)?